Ma'ayan Tzvi (Hebrew: מַעְיַן צְבִי, lit. Zvi's Spring) is a kibbutz in northern Israel. Located near Zikhron Ya'akov, it falls under the jurisdiction of Hof HaCarmel Regional Council. In 2017 it had a population of 700. The kibbutz was established 30 August 1938 as part of the tower and stockade settlement project by members of the Maccabi youth movement who fled from Nazi Germany. At first, the kibbutz was called Ma'ayan. 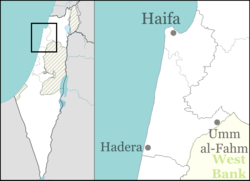 It was established on land which had traditionally belonged to the Palestinian village of Kabera. In 1945, the name Zvi was added in honor of Zvi Frank, a Zionist activist and one of the heads of the Jewish Colonization Association which purchased the kibbutz lands. The kibbutz manufactures optical devices and components for high-tech and advanced weapon systems. ^ Khalidi, Walid (1992). All That Remains: The Palestinian Villages Occupied and Depopulated by Israel in 1948. Washington D.C.: Institute for Palestine Studies. p. 168. ISBN 0-88728-224-5. This page was last edited on 25 May 2018, at 22:29 (UTC).